In the fifth pAsuram, emperumAn mercifully says “I will fulfil all your desires” and AzhwAr asks “When will that happen?”. Subsequently, AzhwAr says “When will I reach your divine feet which carry out effortless functions for the protection of the devotees?”. puNarA ninRa maram Ezh anReydha oru vil valavAvO! puNarEy ninRa maram iraNdin naduvE pOna mudhalvAvO! thiNarAr mEgam enak kaLiRu sErum thiruvEngadaththAnE! thiNarAr sArngaththuna pAdham sErvadhadiyEn ennALE? 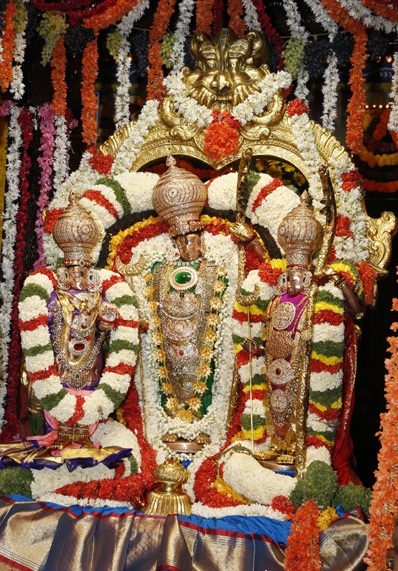 thiruvEngadaththAnE – one who is present in thirumalA! O – revealing the agony of not uniting yet. emperumAn being the unique archer, shot the seven marAmarams on that day; being the primary cause for the universe, he crawled between the two trees which were standing together, fitting well; Oh one who is present in thirumalA where the elephants, which are said to be like dense clouds, reside together! When am I, a servitor, will reach the divine feet of you who is having the great SrI sArnga bow!? puNarA … – Don’t the kshathriyas (warriors) uphold the bow to not hear the sorrowful cries? SrI rAmAyaNam AraNya kANdam 10.3 “kshathriyair dhAryathE chApam nArthaSabdhObavEdhithi” (A warrior upholds the bow so that crying sound is not heard). Oh brave one who straightened the seven crowded trees by your strength and stance and shot at them! O – O highlights the great sorrow. You who proved your abilities to those who doubted your protection, are not helping me who is desirous of you! samkshEpa rAmAyaNam 63 “sugrIvaS SankithaSchAsIth …” – From the day he saw perumAL (SrI rAma) and until he shot down the seven ebony trees, sugrIva kept doubting perumAL’s abilities. Should you who protected him after eliminating his doubt, not protect me who is holding on to you without any doubt? puNarA … – Piercing through the seven ebony trees which stood together, like someone who could casually go through a door, Oh you who protected yourself who is the root of the universe! He did not create the universe after the deluge; only today. He was present then, so he could easily create the universe; but here his existence was threatened [had he been destroyed, the universe which sustains on him would have also been destroyed]. thiNar … – Oh one who is mercifully standing in thirumalA where elephants which resemble dense clouds are residing together! Since clouds and elephants are totally similar, clouds can be considered as elephants and elephants can be considered as clouds. nAchchiyAr thirumozhi 8.9 “madha yAnai pOl ezhundha mAmugilgAL” (Oh great clouds which rise like mad elephants). AzhwAr is not talking about anyathA gyAnam (misunderstanding an object to be something else) in that abode, but everything is enjoyable for him there. thiNar Ar sArngaththu una pAdham – The divine feet of you who are having the great SrI sArnga bow. The divine feet which are the refuge as said in SrI rAmAyaNam yudhdha kANdam 94.17 “SaraNyam SaraNam yAthA rAmam dhaSarathAthmajam” (reached the divine feet of the son of dhaSaratha, which are the apt refuge). Whatever is picked up by the sons of emperor dhaSaratha, that turns into bow. thiNar Ar sArngam – Capturing the enemies in his curved bow. una pAdham – Those who are not captured by the bow [i.e. the favourable ones], will be captured by his feet. sErvadhu adiyEn en nALE – Since you have the bow in your hands, we won’t lose you fearing for the hurdles; now, you just need to inform when I will attain you. This entry was posted in thiruvAimozhi, thiruvAimozhi 6th centum on June 19, 2018 by Sarathy Thothathri.